The South Asian monsoon, which brings rainfall to India and the neighbouring countries during the boreal summer season, is a major atmospheric circulation system. India receives more than 80% of its annual rainfall during the monsoon season, generally occurring from June to September. However, the monsoon onset can also occur as early as May and the withdrawal can occur as late as early October, while the season itself is comprised of several wet and dry periods which occur as a part of the intraseasonal variability. Any variability in the timing, duration and intensity of the monsoon can have a significant impact on rain-fed agriculture that contributes a major portion of India’s GDP. Irrespective of recent growth in service and industrial sectors, agriculture is still the predominant occupation in many rural regions of India. The Indian monsoon also has significant impact on the coal and steel industries, thereby affecting the world economy. Hence understanding and predicting the monsoon is vital. The forecasting centres around the world try to predict the monsoon onset and amount at least a season in advance. However, it is notoriously difficult to predict the timing of the onset as well as the overall seasonal rainfall. The models participating in the latest version of the Coupled Model Intercomparison Project showed considerable improvement in simulating the mean rainfall and variability of the South Asian monsoon compared to earlier models; however, a dry bias still exists over India in most of these models (Sperber et al., 2013). The ability to predict the monsoon at least a season in advance is limited as it is difficult to represent tropical convection (the processes leading to monsoon rainfall) in our forecast models, and we lack a proper understanding of the way in which land and ocean surfaces alter the atmosphere on small scales to initiate monsoon storms. Hence detailed observations of the lower layers of the atmosphere and surface are needed to understand such processes. In order to achieve this, an intensive field campaign was conducted in India during summer 2016 as part of the INCOMPASS project (refer to Dr Andrew Turner’s blog for more detail). 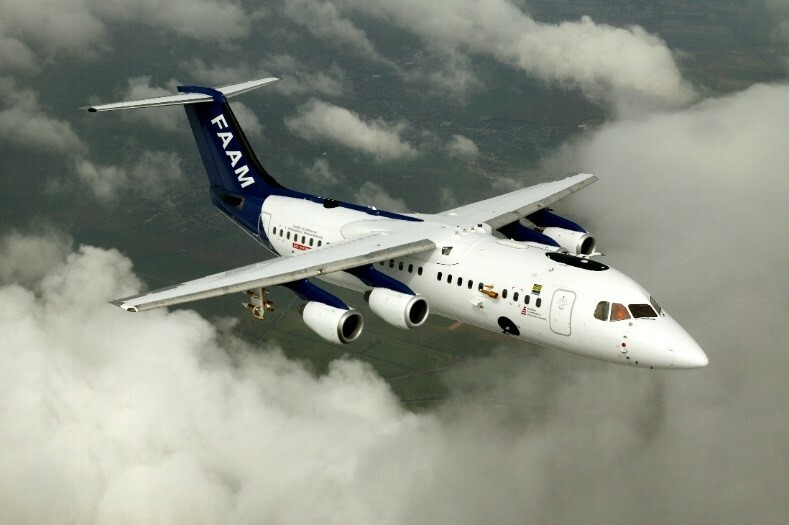 During summer 2016, we took the UK’s Atmospheric Research Aircraft (operated by the Facility for Airborne Atmospheric Measurement), a modified BAe 146, on its first-ever mission to India to gather new monsoon observations (Figure 1). The flight observations were accompanied by ground-based observations from towers that measure the surface temperature, soil conditions and fluxes of temperature and moisture into the atmosphere as well as weather balloons which were launched from a network of weather stations spread over India. We are now using the data collected to challenge and improve our forecast models, at the UK Met Office and India’s National Centre for Medium Range Weather Forecasting. Climate models generally have a coarse spatial resolution, which means that atmospheric and oceanic processes operating at a smaller scale (for example convective precipitation) cannot be predicted by physical equations but instead we have to resort to a process called parametrization. This will help us to represent the effects of finer scale processes such as clouds on the coarser scale meteorology. Due to this inadequacy, climate models when used to simulate the monsoon cannot capture many important features of the monsoon. The most effective way of solving this problem is to use a model with finer resolution (grid spacing). The Met Office Unified Model (MetUM – Brown et al., 2012) uses the same dynamics and physics both at numerical weather prediction and climate projection scales. 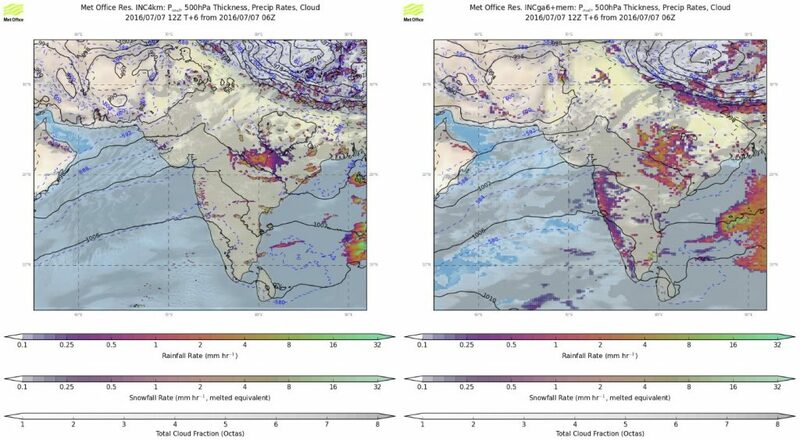 Hence it is a perfect tool to better understand the physical mechanisms involved in monsoon rainfall and to determine the role of model resolution in improving monsoon forecasts. For our use, we have customized the MetUM with a ‘nested suite’, which is a fine-scale regional model placed inside a coarser resolution global model. Using this method, we can operate a very fine resolution (4 km grid spacing) model for South Asia and outside this ‘nest’ the model will have coarser grid resolution (~17 km over the rest of the globe). The 4 km grid-spacing is common for forecasts in the UK but is more computationally challenging for a country the size of India. Figure 2 shows the impact of the grid spacing on forecasts of monsoon rainfall during 2016. It features a monsoon depression, a low-pressure system, that formed in the Bay of Bengal during early July 2016 and shows that it is captured well by the models. However, the details of the clouds and rainfall are much finer. The individual convective cells are apparent in the finer resolution version of the model. This type of monsoon storm is often implicated in heavy monsoon rains and flooding, such as the recent events of August 2017 in Mumbai. Figure 2. Rainfall rate (shaded), snowfall rate (shaded), total cloud fraction (shaded) and mean sea level pressure (contours) from 4 km resolution model (left) and global model (right) on 7 July 2016. An animation for the period 1 to 7 July 2016 is available via this link: http://www.met.reading.ac.uk/~xr911612/home/anims.gif. In the animation, spiral bands of rainfall associated with the monsoon depression are seen over eastern parts of India on 6th and 7th July. Currently, we are running two experiments for the 2016 monsoon with this setup contrasting them by using different land surface conditions such as soil moisture and vegetation types, which will eventually improve our understanding of the impact of changing land-surface conditions on monsoon rains. As the project continues we will pioneer development of even-finer resolution models, down to 100 m scales, which will allow us to examine storm development and frontal weather system structures with high fidelity. By improved theoretical understanding of the physical processes of the monsoon and an improvement in rainfall prediction, the work will allow improved agricultural planning and security of the food supply, benefiting the Indian economy. Brown, A., Milton, S., Cullen, M., Golding, B., Mitchell, J., & Shelly, A., 2012. Unified modeling and prediction of weather and climate: A 25-year journey. Bulletin of the American Meteorological Society, 93(12): 1865-1877. Sperber, K. R., Annamalai, H., Kang, I. S., Kitoh, A., Moise, A., Turner, A., Wang, B., & Zhou, T., 2013. The Asian summer monsoon: an intercomparison of CMIP5 vs. CMIP3 simulations of the late 20th century. Climate Dynamics, 41(9-10), 2711-2744. This entry was posted in Climate, Climate modelling, Monsoons, Numerical modelling, Seasonal forecasting. Bookmark the permalink.